This Idiosepiidae contains the smallest species within the Decapodiformes. 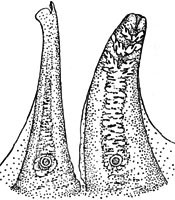 Males in some species mature at lengths of 6 mm ML and females at 8 mm ML (Nesis, 1982/7). 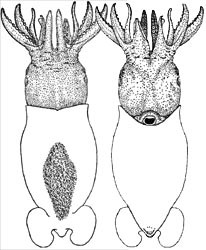 These cephalopods are elongate but have a rounded posterior mantle and separate fins. A unique attachment organ is present on the dorsal surface of the mantle which is used for attaching the animal to seaweed. They are found in shallow water in the Indo-West Pacific. An excelllent in situ video of a female Idiosepius sp. attaching to a blade of grass and then spawning can be seen here. with an adhesive organ on the dorsal surface of the mantle. Figure. Oral view of hectocotylized arms IV of Idiosepius pygmaeus, 18 mm ML, off Philippines. Drawing from Voss (1963). Arm and tentacle suckers without circularis muscles. Tentacles without carpal (= proximal) locking-apparatus. Tentacular clubs with suckers in 2 - 4 series. Funnel without lateral funnel adductors [are these muscles present but embedded in head tissue?]. Adhesive organ on dorsal surface (see title drawing). Figure. Top - Dorsal view of Idiosepius sp., preserved, with an enlargement of a portion of the dorsal adhesive organ showing the glandular (white reflection) epithelium. 12 mm ML, mature female, 05°27'S, 134°27'E. Photograph by R. Young. Bottom -Side view of Idiosepius paradoxus in an aquarium attached by its adhesive organ to a blade of seagrass. Photograph by Takashi Kasugai, Port of Nagoya Public Aquarium. This video shows how the adhesive organ is used in feeding. Mantle not fused to head in nuchal region, but nuchal cartilage absent. Mantle locking-apparatus does not reach anterior mantle margin. Fins completely separate; with posterior lobes. Shell a delicate gladius not reaching anterior or posterior ends of mantle. Right oviduct present but not functional. Eggs attach to substrate in flat masses. A list of all nominal genera and species in the Idiosepiidae can be found here. The list includes the current status and type species of all genera, the current status, type repository and type locality of all species and all pertinent references. I. paradoxus spawns repeatedly in captivity. A single individual may lay as many as 42 batches over a 70 day period (Kasugai, 2006). Developing embryo has a large external yolk sac. Hatching occurs 16-18 days at 20°C (Yamamoto, 1988). Figure. Side view of a spawning female I. paradoxus in an aquarium. The squid is attached to a blade of seagrass by its adhesive organ and is attaching its eggs to the underside of the same blade. Another I. paradoxus is swimming nearby, presumably a male. Photograph by Takashi Kasugai. Kasugai, T. 2006. 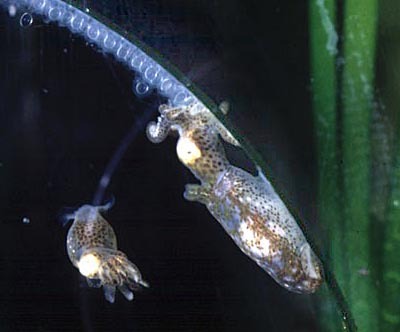 Spawning mode and reproductive output of the Japanese pygmy squid Idiosepius paradoxus (Cephalopoda: Idiosepiidae). Program and Abstract Book, CIAC '06, Hobart Tasmania. Yamamoto, M. 1988. 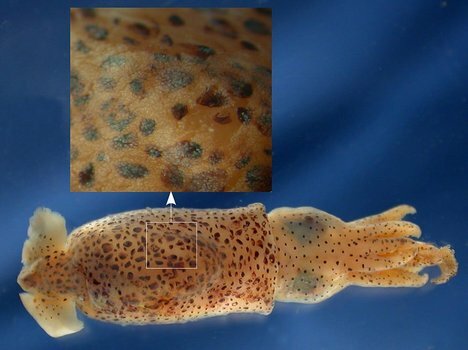 Normal embryonic stages of the pygmy cuttlefish, Idiosepius pygmaeus paradoxus Ortmann. Zoological Science, 5: 989-998. Page: Tree of Life Idiosepiidae Appellof, 1898. Pygmy squids. Authored by Katharina M. Mangold (1922-2003) and Richard E. Young. The TEXT of this page is licensed under the Creative Commons Attribution-NonCommercial License - Version 3.0. Note that images and other media featured on this page are each governed by their own license, and they may or may not be available for reuse. Click on an image or a media link to access the media data window, which provides the relevant licensing information. For the general terms and conditions of ToL material reuse and redistribution, please see the Tree of Life Copyright Policies.